and make for the chook house. half flapping, half waddling steamers of death. mum’s red scrap bucket knocking into my chubby, white legs. 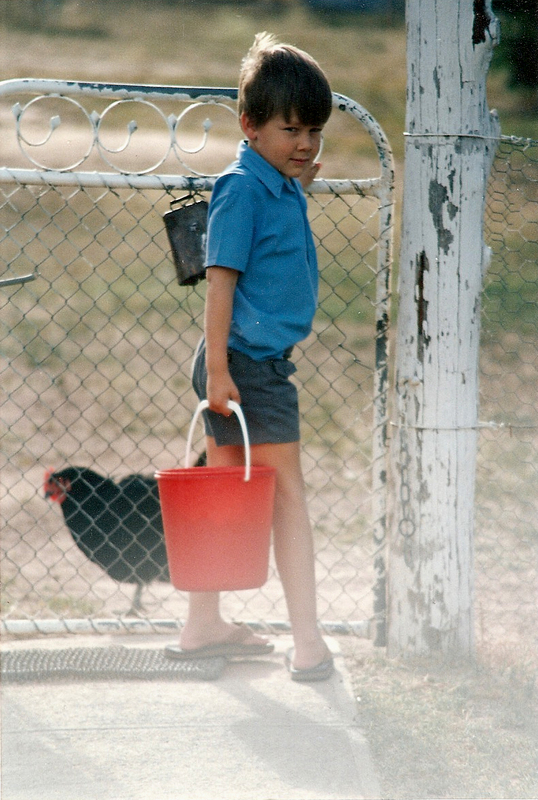 black chooks can run as fast as a six year old. then I would be stuck inside the lions den. gripped by talons of childish fear. and then pour the contents out onto the ground some eight feet below. they wanted only that which was theirs to begin with. that which even I agreed was theirs. and for all I cared they could have it, and did. whether you are eight or twenty eight. it is to be worked with. as a fight or flight mechanism. I feel other black Australorpian shapes in the dark. I must walk the house as my gauntlet, to the toilet out back. not even the snakes on the warm pavers. yet I have semblances of fear. I am only scared, bewildered, tired. scared that if I stay up, I will wake up. so I retreat to bed, to my tiredness. I can make the toilet fine. who invite me, if I would sit. I feel an iris opening in my head. I contemplate how I came to be here. the latter seems less likely in consideration. ‘don’t let your fears gather at the gate’. to piss in a toilet of drought. and I am just a man. This entry was tagged adulthood, Australia, childhood, chooks, farm, fear, gauntlet, learning, prose. Bookmark the permalink. I am just in from sinking- floating deep hot bath. a long desired indulgence, resulting from an overflowing tank after far too much dry. Anyway, I stumble across this poem,which again resonates with me. Primarily because I too had the childhood fear of ‘haunted hens’ & also as my son when very small was a victim of a protective rooster, which struck with fierce talons into his soft tender toddler wrist. I had to scoop up my poor babe from the straw pen floor, he had passed out , limp & trickling blood. Touché Rooster round one. Never to make round two! But I also love this work because I have just laid naked under the shimmering stars, seriously thinking of such childhood fears…fears created in imagination, … I had only just mused at how once the sounds of wombats, possums and gliders – could cause me such a strong instinctive reaction of not only flight or fight for me- but the lesser known third option. to literally freeze. thank god that has mostly passed.